If you have the Remote AH app are you using it to its full potential while your at your computer? Before I go into my tips and tricks lets take a quick look at how the remote AH app works. 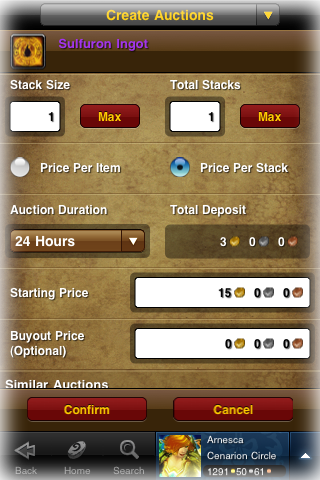 The Remote AH app allows players to access the AH while they are not On-line Post Auctions, Collect Auction Sales, Cancel Auctions and Search and Buy from the AH. 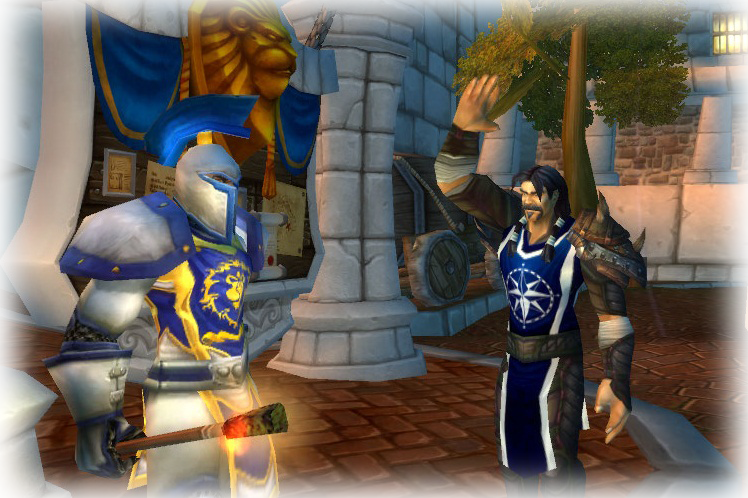 It also allows the same features to be used via the WOW websites (EU and US). Ok so now we have an idea of what the remote is, and how it works. So yes I understand that now I sound completely mad and a little bit obsessive probably too, but I do have a method to my madness. Lets look at a quick example of how some people make gold. Lets say Fred has 4 Characters, 3 on Alliance and 1 on Horde, He regularly makes money by trading cheap materials from his Horde character via the Neutral AH to his Alliance chars with the help of his friend Steven. Fred needs some cheap Thorium Bars so he checks the Ah on his Alliance characters and the price is too high to make a profit, so he logs over to his horde char and checks the AH. Lucky for Fred there is a ton of extremely cheap Thorium Bars so he buys a load up and travels down to the Neutral AH in Everlook. Once in Everlook Fred Contacts Steve on RealID and asks if he is free to transfer the ore for him, Fred then waits at Everlook till Steve moves his Alliance character from Stormwind down to Booty Bay, now Steve was busy running ZA so Fred has to wait for him to finish and then run down (or any other example that means wasting time). Fred then posts his ore at 1c and Steve buys it. Now to me that is an extremely long and inefficient way to cross faction trade, and this is where I use the AH remote to maximum effect. Ok so lets say in the same example above Fred had the AH remote, Fred realises he needs Thorium, he scans the alliance for an acceptable price on his Alliance character and finds no cheap bars, whilst he was doing this he also checked the Horde AH at the same time using his Remote AH app, AHA cheap thorium, so he buys it up without even logging off his alliance character, and contacts Steve immediately. Now this example is a simple show of efficiently saving time and to me that is the greatest asset of the AH remote, when I am sitting at my computer, below is a list of other ideas you may want to try with the AH remote if you have it:However unlike the first example Fred saved time not switching over to his Horde Character, running it to a AH buying the bars then running to the neutral AH. This allows Fred to catch Steve before he starts running heroics, and Steve agrees to help him transfer the Bars, Steve makes his way down to Booty Bay and writes in the search ready for when Fred posts the auctions. Once Steve is in position Fred switches his AH remote app to the Neutral AH option and posts the Thorium Bars. Use it in conjunction with Altoholic to search for materials and speedily transfer them cross faction when in need. To some this may seem a bit simple to be a worthy gold tip, but I see it as a way to spend more time on the real money makers and less time swapping characters. If you want a more direct gold making tip check out my Icy Prism Post! 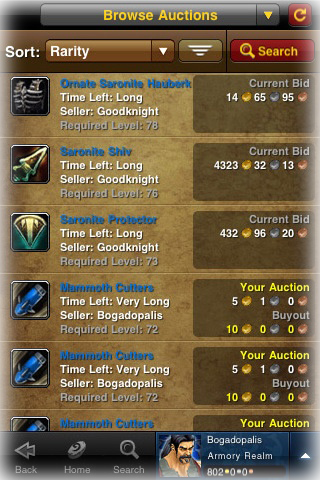 I'd love to know how you get RAH to buy/post, regardless of faction, when you're logged into that account? I have to be logged out to use those functions remotely. Remote AH is one of my favorite tools for money making too. Like you said, It saves a lot of time.I have two WoW accounts, both with a RAH subscription for the most convenience. In my case there is no need to be logged on a single character for a cross-faction transfer as I can just use two RAH at any time I need anything from another side and don't go to a neutral AH at all.And congratulations on reaching your first gold milestone! What am I missing? How do you get items from your horde to alliance characters without using the neutral AH to get them between races? I just started playing again. You can't mail ore/bars, etc. in the mail between factions now, can you? With the use of the Iphone or Online Remote auction house you can access the neutral AH without physically moving a player to it. which will save you time, and allow you to browse items on all AHs without ever changing characters or moving locations. I understand that, but you still need two accounts, correct? I thought I read in your example that you were buying from the same account. I like the blog so far, keep it up. This is a nice post Gimp. I really like the images you included. 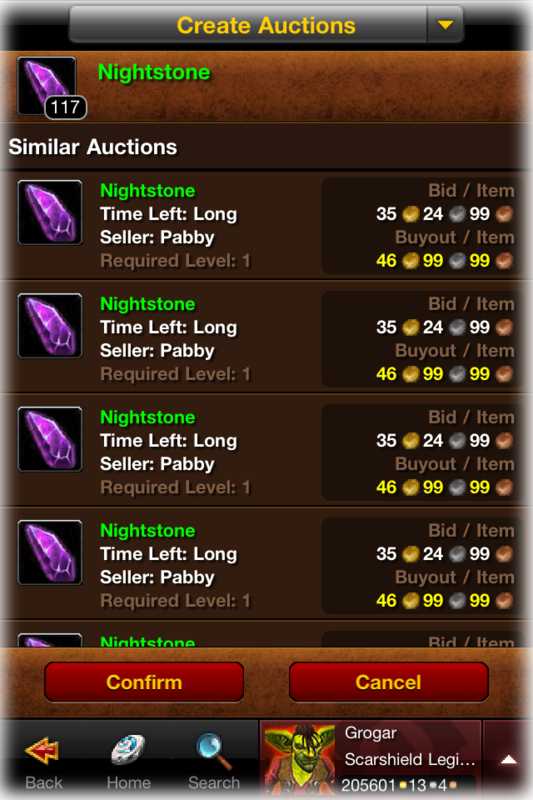 I always wondered how the Mobile Auction House looked on a smartphone.For more ideas how to use those 200 transactions to make a profit, check out my post on The Top 9 Uses for the Remote AH. Just To warn people alot of the tricks have been worked around by blizzard and you can no longer buy or sell while logged into the game on the same account.